Ireland forward Dan Leavy has been ruled out of the Rugby World Cup with what his province Leinster describe as "a complex knee ligament injury". Flanker Leavy, 24, was carried off on a stretcher in Leinster's 21-18 European Champions Cup semi-final win over Ulster in Dublin on Saturday. He had replaced fellow international Sean O'Brien just 10 minutes earlier. Leavy underwent an initial scan on Sunday but Leinster say the injury "needs further assessment this week". "He has been ruled out for the remainder of this season and into next season to include the Rugby World Cup," Leinster Rugby indicated on Monday. Leavy had just returned from injury, having taken no part in Ireland's Six Nations campaign. The Leinster flanker had an outstanding Six Nations campaign last year as Ireland clinched only the country's third Grand Slam. He won the last of his 11 caps against Argentina in November. Speaking on his Instagram page, Leavy said he was "struggling to put into words, how devastated I am". 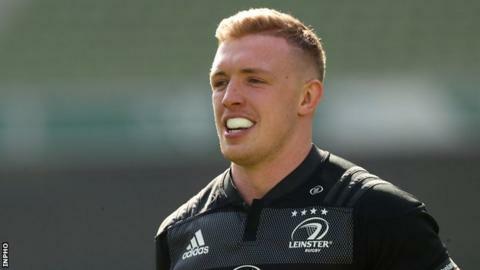 "Firstly, to miss the business end of the season with my Leinster brothers and our opportunity to pursue another European and league title," said Leavy. "Secondly, to miss an opportunity to play in a World Cup in Japan is haunting my thoughts. Leavy vowed that he "will be back", adding that he would "watch on as number one supporter". Ireland coach Joe Schmidt already has concerns over the fitness of flanker Josh van der Flier, who is out for the remainder of the season after undergoing groin surgery. He could return for the World Cup in Japan, which starts on 20 September, with Ireland's opener two days later against Scotland.